This photo was taken on April 27, 2016. The "Take It!" came from deciding to have some fun with the plastic bags that are put on the newspapers I have delivered to my home. I subscribe to The Washington Post, The Wall Street Journal, and USA Today. Each newspaper gives me a viewing on different news from around the world, business, as well as entertainment. Some papers have different views on the same subject which fascinates me. I do not read all the articles, but try to keep current on a lot of world happenings. I also listen to NPR on the radio and watch a little TV. I am an avid watcher of Sunday Morning on CBS and Face the Nation. I usually just place the newspaper plastic bags in the recycle bin and let it go at that. I thought it might be a sort of community service thing to put a box of the bags out in front of my house, next to the driveway for anyone that might be walking their dog and possibly forgotten to bring along a bag to pick up their dog's poop. Rather than just stuff the bags into a receptacle, I decided to make the grab on them easier by wadding them up and putting a rubber band around them. 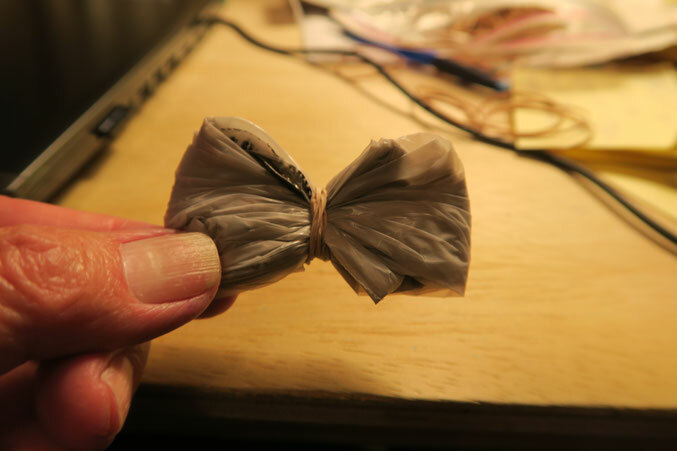 What quickly emerged was a sort of bow tie looking thing, that seemed to improve in appearance as the process was engaged in, of twirling and twisting the plastic to make the placement of the rubber band easier to put into place. ?? By the time I had gotten through my stash, and engaged in the sort of quasi mindless exercise, I found I had a variety of colors, and thus the fun has begun. The After Take: I do not know where this will go, but it has been fun in the doing. There are some other things that are happening here at my home. I am gradually converting my space to be a combo of living quarters and store like display in order to begin to sell some of my work. I hesitate to refer to it as a gallery for it is a bit less formal than that. I plan to sell items on the internet and will open the store by appointment. I am not presumptive enough to think there could be crowds but want to avoid any type of congestion as my house is in a neighborhood setting. In setting appointments, I plan to limit the number of people that can be in the house at any one time to four, unless it is a family. I will be a narrator and explain the products and make certain to give some take home demonstrations that will be of use to everyone. I will sell some products that are intensely simple and inexpensive that are not made by me, but I think almost anyone can use. I will close by thanking all of you for your good wishes which were expressed while I was on a sabbatical of sorts. I am quite all right and energized by my time away. I must note that I was never fully away as took many photos which I will share, and thought of all of you very often. A big thanks goes to Taylor for plowing through some mind boggling challenges of his own and keeping the site going all the while.